DV Brown & Warm Up WNY Initiative - D.V. Brown & Associates, Inc. DV Brown & Warm Up WNY Initiative - D.V. Brown & Associates, Inc.
Tonawanda, NY – Along with Arc Building Partners and their colleagues in the construction industry, D.V. 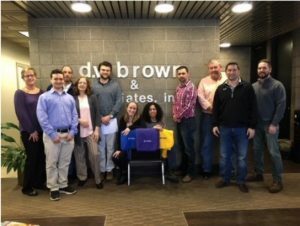 Brown & Associates is continuing to be a community leader by donating 100 blankets to kids in need through the Warm Up WNY Initiative and NY Senator Tim Kennedy. The goal, once again, was to provide a blanket for every child who goes through the doors of Oishei Children’s Hospital.